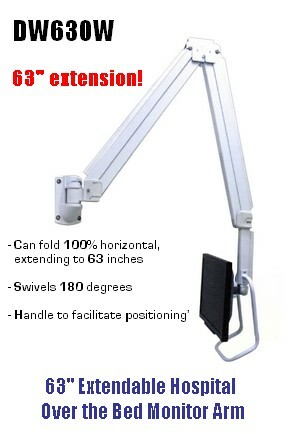 ...with Adjustable VESA Monitor Bracket: can 100% horizontally face the bed or any wall. * Limited Time Sale Price: $498.00! 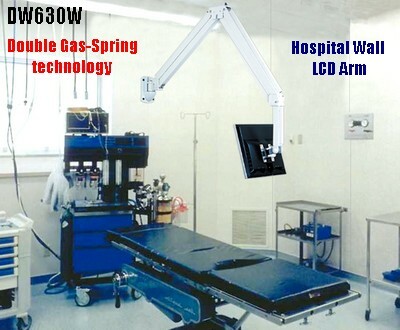 With the new gas assisted DW630W, easily view a LCD Monitor in bed. Try multiple viewing angles, with movements facilitated by its assisted articulated monitor wall arm, which extends all the way to a straight 63" (horizontal to the floor). Then, when not in use, fully push it back against the wall. It also swivels 90 degrees to each side and even can face forward. The torque of the movement can be adjusted, to suit individual applications. This hospital monitor wall arm has a great range of motion. Click here to see a project performed by Amplex, one of our most creative client-installers.